It is not a family car. It is very difficult the older you get getting in and out of the car. It is very good in gas. Having problems with the turn single lights though. They have stopped blinking though the light still comes on however it does not flash. My windows has fell threw and had to be replaced as well and the passenger window doesn't roll down now. Over all I've had cat since 2002 it's been a good car. Just need the fuel pump replaced. 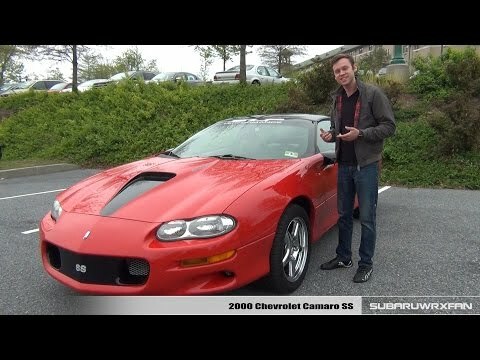 2002 Camaro is a great modern day classic. My Camaro is amazing. I've always liked to be the fastest. I am really lucky that this model was available for the price I paid. The paint seems to be magic as its never had a scratch. 2002 Chevy Camaro are great on gas as well. I drive across state twice a week and the only repair I have to make was replace the brake pads. Fun summer car. Reliable. I have only 82k miles on my 2002. Hard to get in and out with my arthritis. Difficult to work on. Expensive repairs. It's a fun car. Love the t tops in the summer. Its fast. Generally reliable. Tough to drive in the snow though. It is hard to judge as far as parallel parking. You cant see where the front or back is when parking. Certain passenger vehicles fail to conform to the requirements of Federal Motor Vehicle Safety Standard No. 208, "Occupant Crash Protection," and No. 214, "Side Impact Protection." These vehicles may have welds near the lower driver's side door hinge that do not meet specifications. In a crash, an occupant could receive severe injuries. Dealers will install structural rivets. The manufacturer has reported that owner notification was expected to begin during January 2002. Owners who do not receive the free remedy within a reasonable time should contact Chevrolet at 1-800-222-1020 or Pontiac at 1-800-762-2737.